SOE President John Smedley said that the sequel to the MMO shooter Planetside will land in March 2011. While getting the tour of the Sony Online Denver studio, I was able to snag John Smedley to chat for a few minutes on the state of the gaming industry. We talked about SOE's biggest competitor, Blizzard, and how other MMO companies react to what the WoW-maker does, as well as what can be learned from the demise of APB's Realtime Worlds. But when I asked him to confirm whether the titles that I'd been asked out to Denver to see, Magic The Gathering Tactics and DC Universe Online, were the only games in the pipeline for SOE, Smedley dropped a bomb. Not only is he heavily invested in social and casual games, but Smedley is super excited for Sony's return to the MMOFPS genre with the tentatively titled Planetside Next. Sony has hinted at a sequel with that working title before, but this is the first time that we've gotten wind of a release window. "We have a very big launch coming in the month of March," Smedley said. "It's a big first person shooter franchise that we're really happy with." I took a leap of logic and asked whether it was Planetside. "Could be," Smedley said sheepishly. "We haven't technically announced it." He then told me that I could say that he "hinted" that the new Planetside was imminent, which translates to 99% of a confirmation. "This is the farthest I've gone [discussing it with the press] and the PR people are going to shoot me." 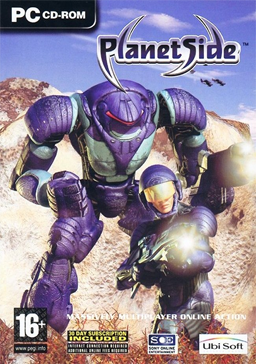 As for why it's called Planetside Next, it appears that Smedley might have learned something from his signature franchise. "We don't have the official name for it. Planetside Next is kind of the working title," Smedley said. "We've learned some lessons with Everquest II , not one of the better moves that we've ever made. We should have called it EverQuest Something. Having Everquest I and II sit on the shelves at the same time, in hindsight, was probably not the the brightest of moves." That's because the two fantasy MMOs are separate products which both have their own servers and audience. That will be less of a problem with Planetside, due to the small number of people still playing the 7 year old game on its one remaining server. Does Smedley think that the update will bring in more players than the first one did? Well, it's safe to say that he is excited about it. "[Planetside Next] is the coolest god-damned game," Smedley said. "I'm so in love with that game."